The rediscovery of Thamnophis eques insperatus (the Zacapu Mexican Garter) in Zacapu, Michoacán, Mexico. During his visits to the transvolcanic belt in Mexico in the sixties Roger Conant caught and prepared large series of snakes. 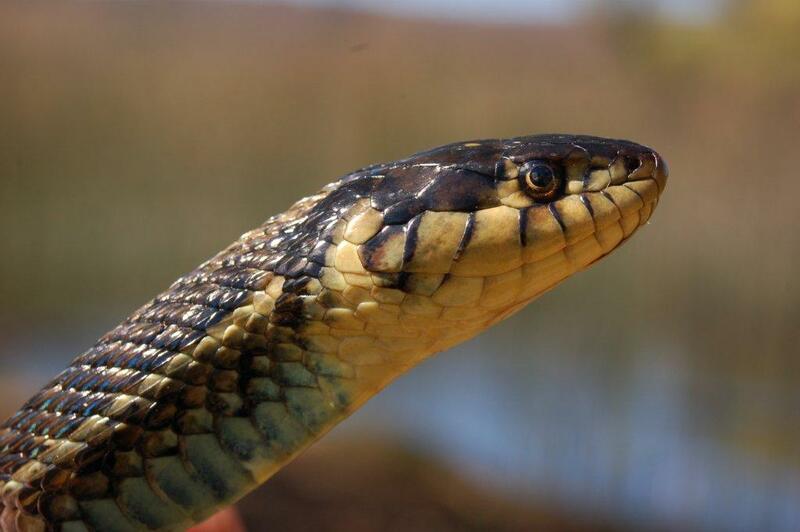 Analyzing these large series of garter snakes in 2003 (40 years after his visits to the area) resulted in the description of 7 new subspecies of the Mexican Garter Snake (Thamnophis eques). 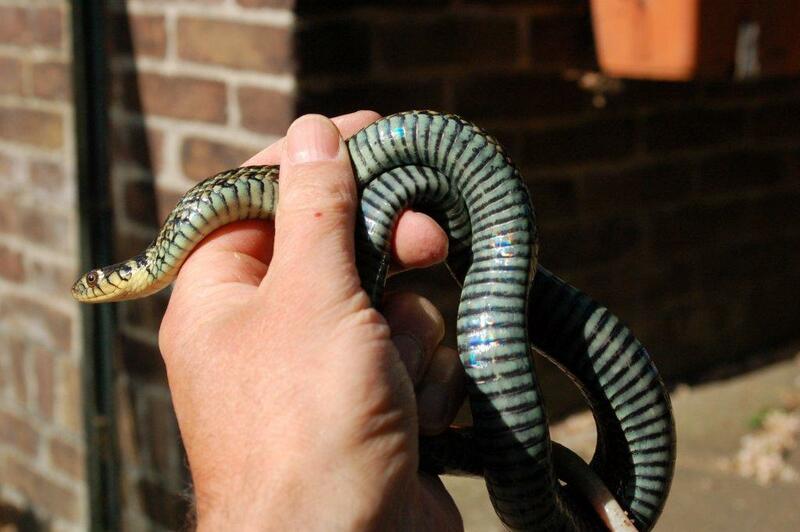 Previously only 3 subspecies were recognized: Thamnophis eques eques, T. e. megalops and T.e.virgatenuis. One of the 7 new subspecies has been described by Conant (2003) after finding one “dead on the road” specimen. He found this snake on transit from one lake to the other in an area which did not seem to be suitable for such an aquatic species. Because of the unlikely place and the unexpected aspect he gave the subspecies the name Thamnophis eques insperatus. Insperatus is Latin for “unexpected” or “unhoped for”. The snake was strongly patterned with large squarish spots and was strikingly different from the surrounding subspecies (which were also newly described) Thamnophis eques cuitzeoensis, T.e.patzcuaroensis en T.e.obscurus. 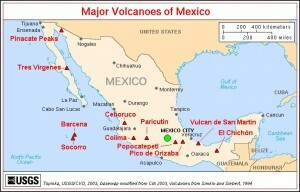 During my travels through Mexico I tried to discover this subspecies that never has been seen nor described alive. Does it still occur in the Zacapu area and how does it look in real life? 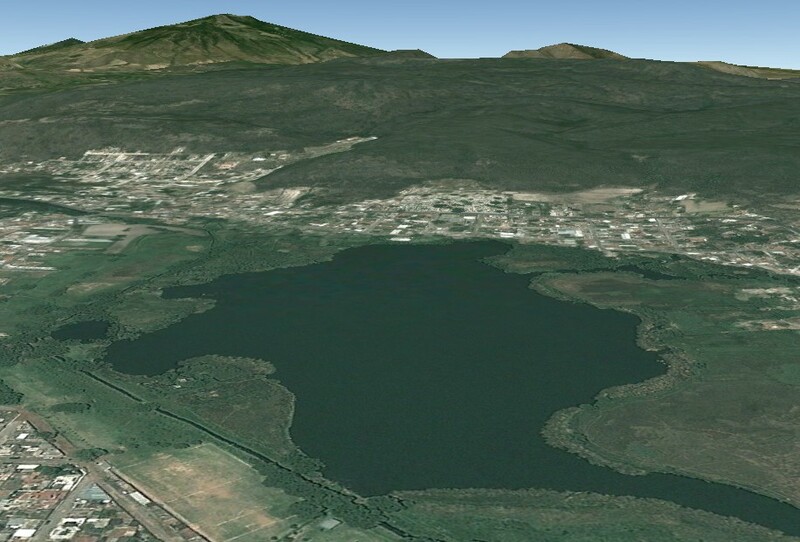 Lake Zacapu is situated in the state of Michoacán at 2000 m above sealevel. The lake borders the town of Zacapu and is fed by a large spring. 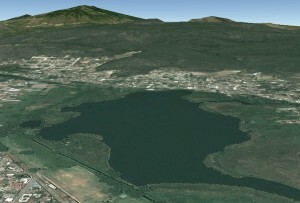 It is relatively small lake with a maximum length of 1 kilometer and a maximum width of 400 meters. The water in the lake looks crystal clear and it gently flows towards a canal. The canal is connected to a network of canals that probably supply water to the surrounding agricultural fields. The water in the lake seems deep and dark and there are lots of reeds and other water plants growing in the lake. The banks are covered with reeds and many herbs and plants and they (partly)consist of quaking bogs. On the internet even quicksand was mentioned. So you better be careful when searching for snakes. Once the water flows into the canal (partly through some sort of factory) the water looks very dirty and polluted. The lake is known for some endemic species of vertebrates, like Ambystoma andersoni (a salamander that inhabits the water permanently) and a fish species (Allotoca zacapuensis). On November 30th 2008 I was able to visit the natural habitat of T.e.insperatus. I arrived around 9.30 PM in Zacapu. I checked out the borders of the lake searching for snakes. Fairly soon I observed a large and dark snake basking on the banks of the lake. The snake tried to escape into the water but luckily I was fast enough. It was a large female T.e.insperatus. I was fairly sure that 2 smaller snakes escaped from the same spot but it all went a bit too fast to be certain. Since the female recently had shed it’s skin it is not unlikely that the smaller snakes were males that were attempting to court the female. It was still fairly cool and the grass was wet of the morning dew. The snake also felt colt. Total length of the female was 95 cm (83 cm snout vent length (SVL) and 12 cm taillength(TL)). The snake had fed recently. She was predominantly black with some underlying pattern. The lateral stripes were clearly defined though and bluish green in coloration. Very unlike the description of Conant (2003) with large spots on a pale color somewhat like T.marcianus. The next 45 minutes of searching did not reveal any snake and the walking became challenging due to the quaking bog. With the quicksand in my mind and the fact that I was all by myself I decided to turn around. Better safe then sorry. When I was almost at the spot where I had started searching I saw a large snake that was basking in plain sight on a old and bent patch of reeds. I had to take some risks in order to catch it and I took a large jump into the vegetation hoping the quicksand would not get me. I was lucky and the snake was too cold to make a quick escape. Again a female T.e.insperatus. A huge snake with a total length of 122,8 cm (98,5 cm SVL + 24,3 cm TL) which was about to give birth within a week. The snake was yellowish brown in coloration. All 3 stripes were visible. The dorsal strip was straw-yellow and the lateral stripes were more whitish. A pattern of spots were visible between the stripes. 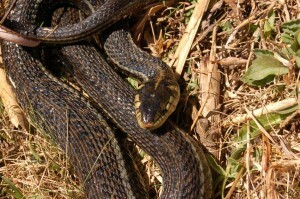 This snake was more in line with Conant’s description in 2003. I continued my search along the canal which looked very polluted. 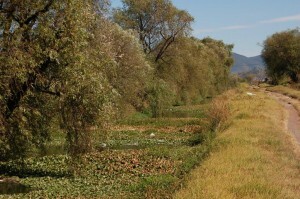 After several 100 meters the canal is surrounded by agricultural fields. 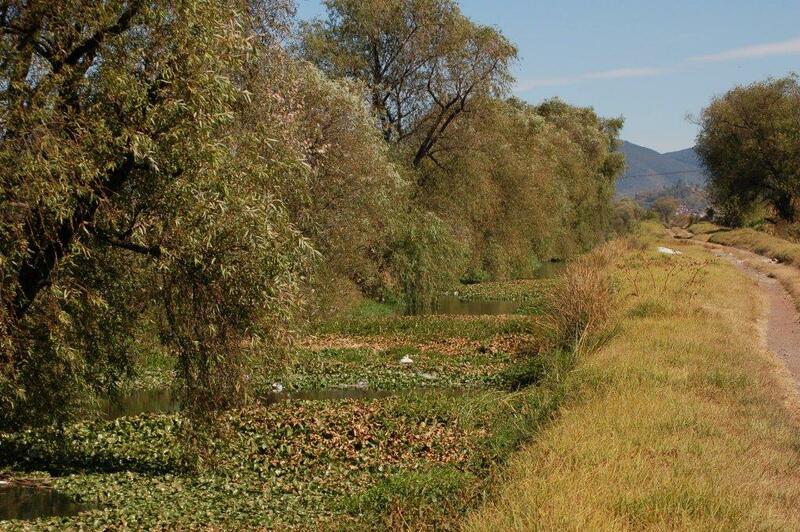 The banks are steep and relatively inaccessible and densely vegetated with willow trees , high grasses and other plants. In the water itself parts were overgrown with water hyacinth. Although I had little hoop to find any garter snakes here due to the heavy water pollution (also no sign of fish or frogs) I decided to check out the banks anyway. A basking snake would remain unnoticed from above, so hard work was necessary. The sun had already risen quite high and the temperatures felt like 30 °C. 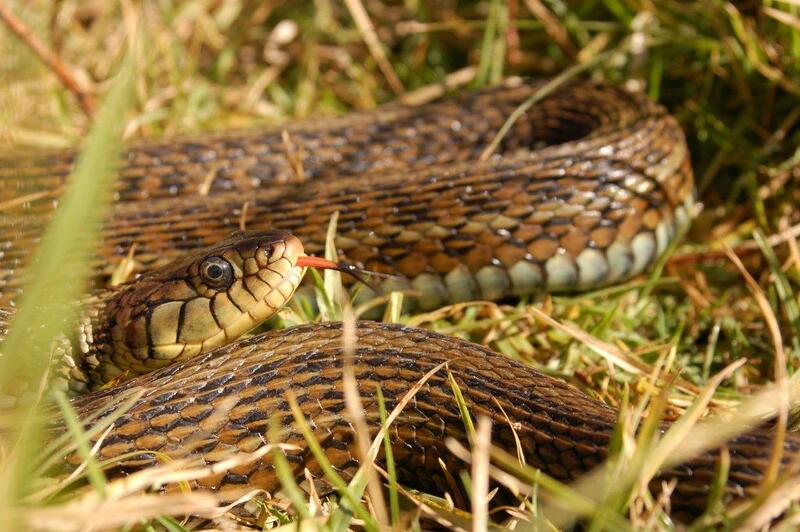 (Thamnophis melanogaster canescens). The brownish-grayish male had a total length of 66,2 cm (52,2 cm SVL + 14 cm TL) . He was practically pattern less, accept a faint dorsal stripe. Eight minutes later I could catch a male T.e.insperatus that was basking on the steep bank between the high grass. He had a total length of 89 cm (69 cm SVL + 20 cm TL). The snake was very dark (practically melanistic) and was about to shed its skin. Although darker he resembled the first female I caught. In the next 15 minutes I saw 2 more snakes of which I was able to catch one. Another male T.e.insperatus with a total length of 77 cm ( 60 cm SVL + 17 cm TL). Also this one was very dark. In the following 45 minutes (until noon) I could see or hear about 10 snakes that all got away. It was getting very hot, the snakes were very fast and the banks difficult to access. So catching became increasingly difficult. 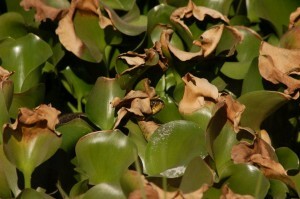 I did observe a dark adult T.e.insperatus that was crawling through the water hyacinths. Possibly hunting for frogs? Although I did not see any frogs. Finally around noon I was able to catch a female T.m.canescens ( 65,9 cm in total; 53,2 cm SVL + 12,7 cm TL). The snake was pale brown in coloration with little pattern. A faint trace of the dorsal stripe was visible. She was well fed. At 12.15 PM I caught another T.m.canescens (after missing about 3 snakes): it was a little male with a total length of 38,8 cm (30,2 SVL + 8,6 cm TL). 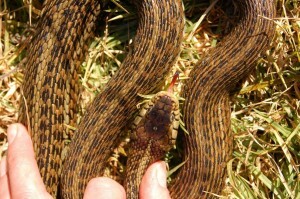 The snake was red with lateral stripes. Well nourished. Two other T.m.canescens managed to escape. At 12.30 PM I was back at the lake itself, hoping that more specimens of the Mexican Garter Snake had become active and would be basking. The first snake I found basking was a beautiful reddish brown male T.m.canescens ; 57,7 cm total length (44,5 cm SVL + 13,2 cm TL) with both lateral stripes and a dorsal stripe. The snake looked healthy and well nourished. Ten minutes later another male T.m.canescens was seen basking. It was grayish without any pattern or stripes with a total length of 57 cm (46 cm SVL + 11 cm TL). From 1.30 – 2.00 PM I checked out the canal one more time, but less thorough. I saw/heard not as many snakes as in the first walk. I saw 2 T.m.canescens and one large male T.e.insperatus (which I did not measure). Another male T.e.insperatus was seen swimming in the water. The last observation of that day was at 2.10 PM: A T.e.insperatus was basking in the canal on a field of water hyacinths. The snake appeared more brown then most of the almost melanistic snakes I had seen, but since it was quit far away I could not observe her in detail. Because of the size (large) of the head I suspect it was a female. Thamnophis eques insperatus, juveniles of a few days old (captive bred, F2); light and dark morph. I observed 2 phases of Thamnophis eques insperatus in the wild: a dark (almost melanistic) phase and lighter yellowish phase. But since I saw only a small number of snakes it is too soon to say that T.e.insperatus really occurs in 2 phases or whether this subspecies is simply very variable. Only 1 (or possibly 2; the snake observed basking on the hyacinths) of the 16 T.e.insperatus that I observed where yellowish brown in coloration. The majority of the snakes was very dark though. In the dark specimens the dorsal stripe is hardly visible. The greenish blue lateral strip, situated on scale row 3 and 4 is usually clearly visible. Dorsum is mostly black. But since all the dark (black) dorsal scales have lighter colored brown keel it seems that the snakes have many fine lines. The center of the dark scales is often brownish. This creates a nice mosaic pattern, which can be challenging to describe in detail. Especially with the fluorescent nature of the scales. A subdues pattern of a double row of large dark spots is visible in some specimens when the light falls under a certain angle on the snake. Especially when the (partly white ) skin is stretched due to pregnancy or after eating a large prey. In the lighter colored snakes all 3 stripes are clearly visible. Also the double row of spots between the stripes is clearly visible, although I have not seen a pattern as strong as Conant (2003) describes. Dorsum is yellowish brown. Ventral scales are bluish-grey with a dark edge. The scales on the throat and underside of the tail are clearly different from the ventral scales similar to the other subspecies from this region. The throat is mostly bright yellow and the underside of tail has a orange-pinkish coloration. The upper labial scales are also bright yellow with black sutures and often a sort of yellow ring is present in the neck, although this is variable. 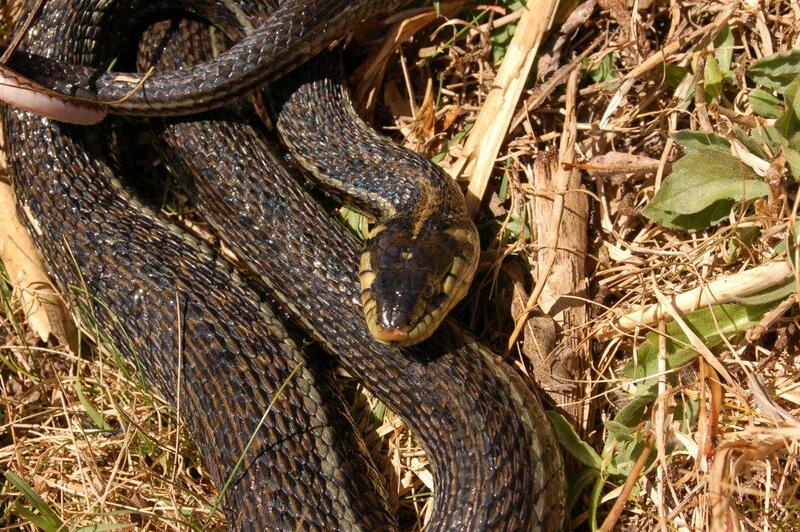 Some snakes slightly resemble the European Grass Snake (Natrix natrix) in this aspect. The upper side of the head is black or dark brown in most snakes. Thamnophis eques insperatus, female (dark morph), 95 cm total length, photographed in the wild on November 2008. 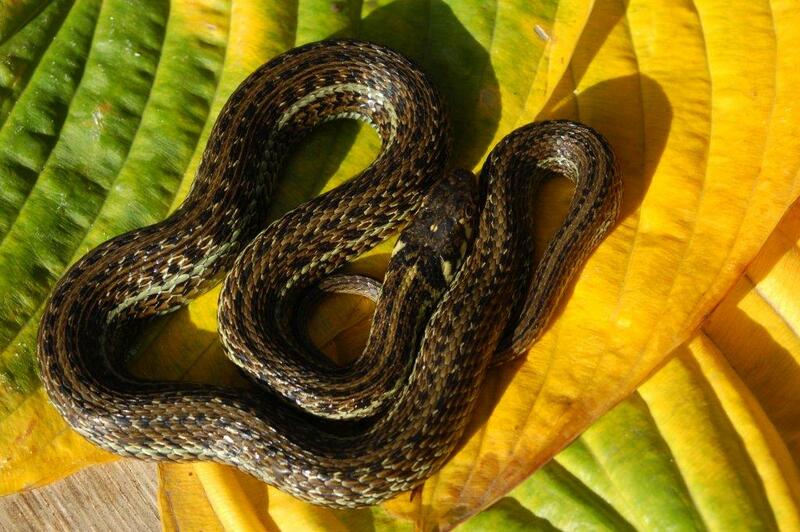 Both sympatric garter snake species, T.eques and T.melanogaster, were still active in Zacapu at the end of November. 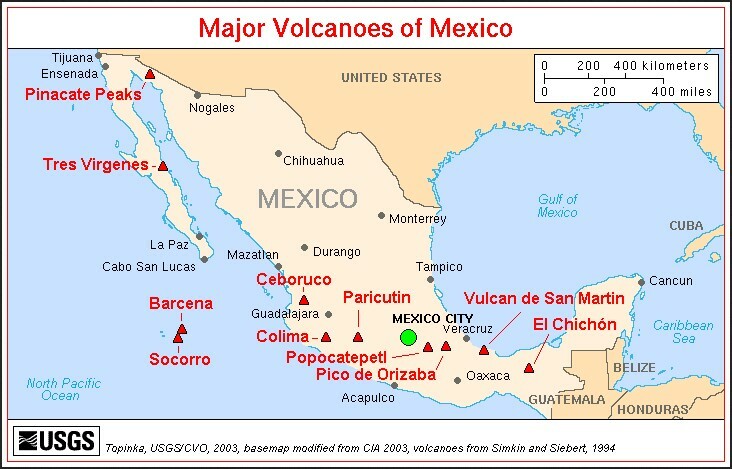 This is in line with my observations at Lago de Chapala (Bol, 2010) and Lago de Cuitzeo (Bol, 2007). Most snakes looked well nourished and healthy and some showed clear signs of recent feeding. One of the female T.e.insperatus was pregnant and was about to give birth to 20 babies. This is extremely late in the year. Comparing the observations of the morning tour (9.30 AM-12.3 0 PM) with those of the afternoon tour shows some trends. Near the lake I found early in the morning 2 (maybe 4) T.eques and in the afternoon only 2 T.melanogaster. Near the canal I observed in the morning 20 snakes, of which at least 50 % belonged to T.eques. Later in the afternoon I saw only 7 snakes, 3 of them were T.eques. It looks like T.melanogaster becomes active later in the day then T.eques. T.eques starts basking early in the morning, but after noon I did not observe as many T.eques basking. This might implicate that they hide more between the vegetation or in retreats. They also may be hunting. For snake hunting you need to be on the right place on the right time. During a visit late in the afternoon you might miss all T.eques activity at this location for instance. 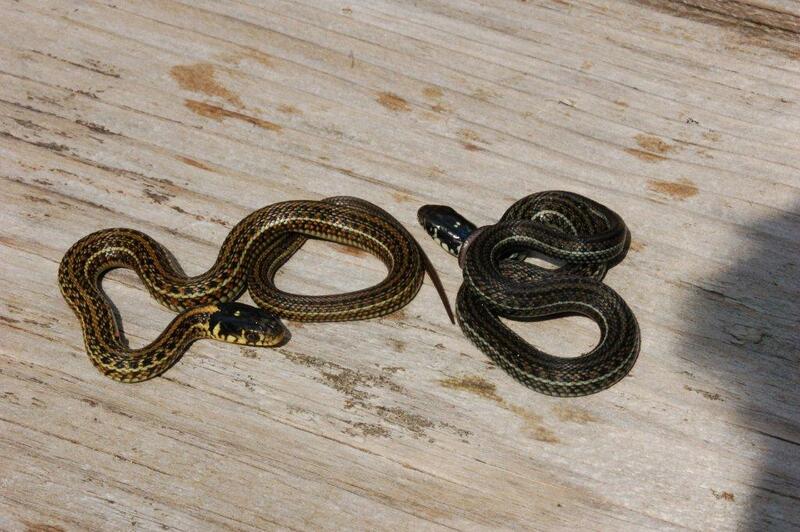 Both species of Thamnophis seem to occur in relatively high numbers and look healthy and well nourished. I find it remarkable to find such a large number of snakes along the obviously strongly polluted canal , all of them looking well nourished. It is not very clear what both species prey on. It is likely that fish are a major part of their diet. I have not seen any frogs. 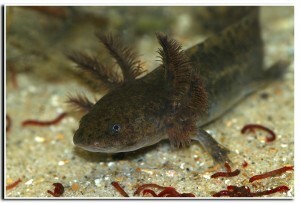 But frogs and salamanders (Ambystoma) are also potential prey. The pollution of the canals could be a clear threat to survival of T.e.insperatus. The lake (spring) looks unspoiled and clean. The quacking bogs/quicksand prevents building on the banks as this happens near other lakes. T.e.insperatus only occurs near Zacapu and the connected complex of canals. Conant (2003) only found a DOR specimen that must of lived in the complex of canals. 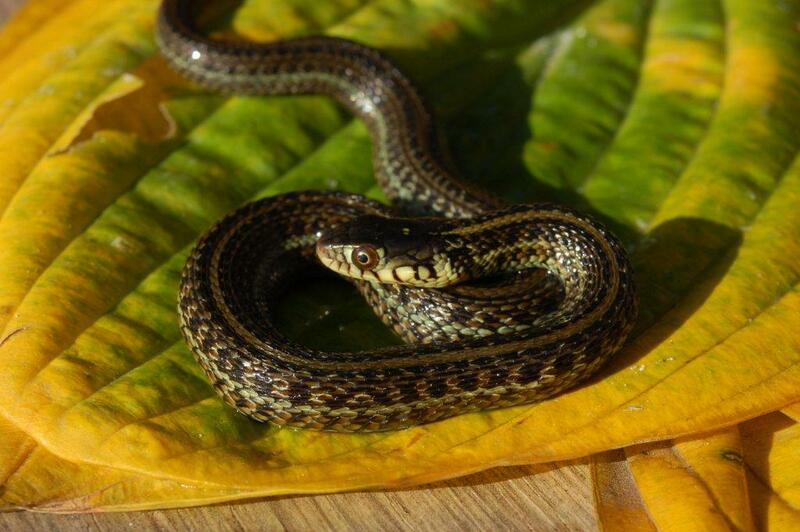 A visit to “La Laguna de Zacapu” on November 30th 2008 showed that Thamnophis eques insperatus still occurs in good numbers. 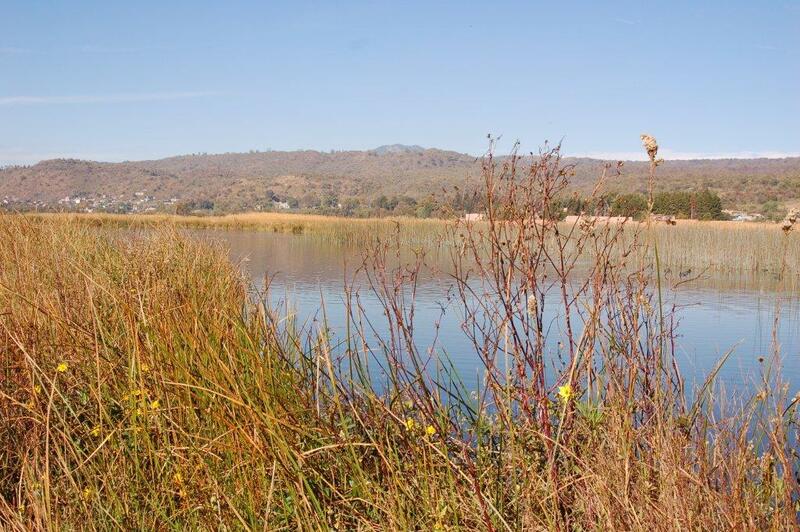 T.eques and T.melanogaster share the habitat, just like in other lakes in the region (Lago de Chapala (Bol, 2010) and Lago de Cuitzeo (Bol, 2007) ). 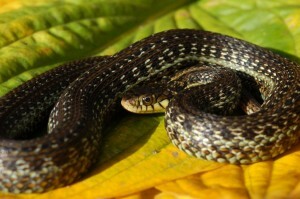 The observed specimens of T.e.insperatus differ from the snake that Conant (2003) found in the sixties of the previous century. The snakes do differ visually from T.e. cuitzeoensis and T.e.obscurus though which seems to confirm the status as a separate subspecies. The observations also reveal some new aspects of the ecology of this beautiful Mexican Garter Snake. The species was still actively feeding, hunting and basking so late in the season. One female was even about to give birth, probably in early December, of approximately 20 babies. Despite the fact that the snakes occur on a high altitude (2000 m above sea level) it is very well possible that they do not go in hibernation during the winter.